in Owensboro’s historical downtown district, is a Casual, family-owned restaurant, serving traditional food with a Southern influence. Enjoy brunch, lunch and dinner in our historic home built in 1905. We take reservations yet walk-ins are welcomed. In a hurry? We have take out and delivery. The Miller House Restaurant offers seasonal menus to ensure the highest quality produce and proudly serves Kentucky Proud products. We also grow our own vegetables in our personal garden for the freshest meal in Owensboro. Named one of the 111 Best Food Finds in Kentucky. From elegant eateries to diners and dives, from holes in the wall to hometown hideaways, from roadside restaurants to backwoods barbecues, 111 Fabulous Food Finds in Kentucky showcases the best places to enjoy the best bites in the Bluegrass. The Bourbon Review Magazine - The Miller House was named one of the Best 55 Bourbon Bars in the Country. You’ll have to travel down to the basement to take in their Bourbon collection, that features several one-of-a-kinds. – J.T. The Bourbon Review Magazine - The Miller House was named one of the Best 55 Bourbon Bars in the Country. 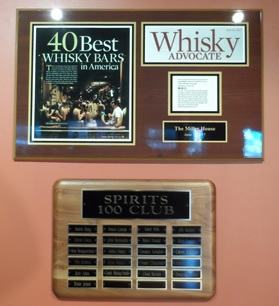 Whiskey Advocate - Ranked one of the BEST Whiskey Bars in America. Spirits is the cozy little bar under The Miller House. With an eclectic mix of patrons, anyone coming to Spirits for the first time will surely feel right at home. As a bourbon - focused bar, we always have more than 600 bourbons in stock, making us the largest Bourbon Bar in Western Kentucky. All bourbon aside, we also offer a wide variety of signature martinis, mixed drinks, beer, wine, and live entertainment!. All bourbon aside, we also offer a wide variety of signature martinis, mixed drinks, beer, wine, and live entertainment!